Ultra-hip club with inventive contemporary Pacific Rim cuisine fires up OC’s night scene. 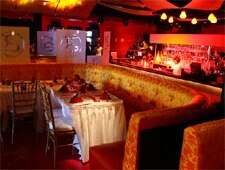 : Everything in Fury's plush palace has sleek finishes, fiery dragon images and pulsating tones of red, black and gold. A sophisticated crowd of twenty- and thirty-somethings shows up for late-night drinking and dancing, but the owners also smartly brought in Joachim Splichal protégé Sevan Azarian to make Fury into a fine dining restaurant as well. Azarian’s Pacific Rim-meets-European cuisine is rather good, especially the Japanese-influenced dishes such as the sunset roll with its mix of shrimp, crab and ahi dosed with three spicy sauces. Or try the miso-braised beef short ribs next to a light wasabi potato purée. We also recommend the plump wood-fired sea scallops. Around 9 p.m., the lights dim and the place revs up to a heated frenzy as a high-energy bar and dancing spot.